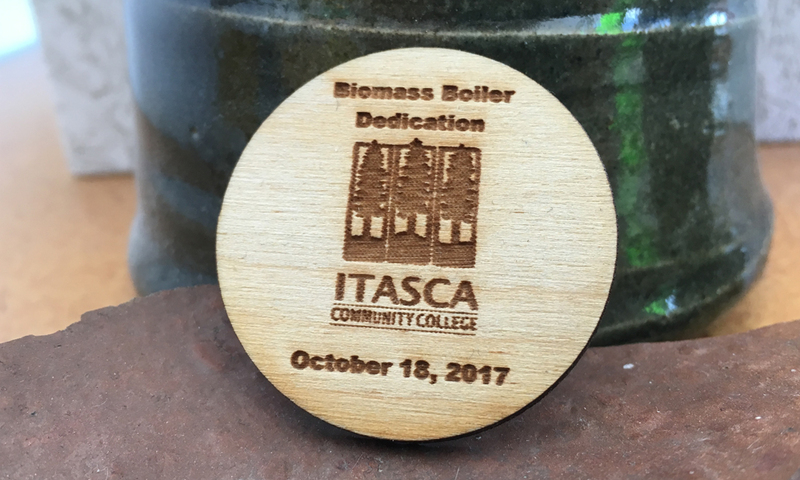 As part of Bioenergy Day last fall, Itasca Community College (ICC) held a ribbon cutting for its new Messerschmitt three million BTU wood boiler. Instead of a traditional ribbon cutting, attendees threw branded wood chips into the storage bin to be burned with the rest of the woody biomass upon firing. Due to the unseasonably warm weather, it wasn’t cold enough to fire up the wood boiler at the ribbon cutting, but it’s been operating in full swing since November. The project demonstrates the opportunity of woody biomass to meet heating needs by drawing on local resources and generating local economic benefits while reducing overall cost. I recently caught up with ICC faculty member Brad Jones for an update on the project to hear how it’s been operating, and from what he told me, ICC is very pleased with the results. The Messerschmitt wood boiler isn’t ICC’s first foray into heating the campus with a wood boiler. In fact, ICC installed its first wood-fired boiler system, a Burnham three-pass generator with an output of eight million BTUs, in 1987-88 with the goal of it serving as the primary heat source for the campus. Unfortunately, frequent manual labor and the receipt of low quality feedstock rendered the system inefficient, forcing the campus to shut the system down in favor of its more efficient natural gas boiler during the 1990s. In 2008, ICC seized an opportunity to use waste product in the form of high quality wood chips from the Rajala sawmill and started the old wood boiler back up. The campus used nearly 500 tons per year of this woody biomass over the next two heating seasons, but the economics of the new feedstock proved to be too costly, especially given the low efficiency of the old boiler. With newer technology on the horizon, ICC researched the feasibility of retrofitting the Burnham boiler system to accept lower quality feedstock directly from the forest. Extensive research between the Swedish Bioenergy Association, ICC, and Itasca Economic Development Corporation in 2012 revealed that a smaller biomass boiler with an output of 2.8 million BTU utilizing direct from the forest feedstock with a moisture content of 45 percent could provide nearly 90 percent of ICC’s heating requirements. In 2015-16, the new Messerschmitt boiler was installed. While ICC could retrofit much of the old infrastructure, the project required modifications to the storage bin and replacement of the feed system and boiler. Over the course of the year, ICC’s Messerschmitt wood boiler provides 80-90 percent of campus heating requirements. Two natural gas boilers with the same heating output of three million BTU provide the remaining 10 percent of the campus’ needs. However, Jones indicates that the wood boiler operating on its own does a better job compared to the natural gas boilers. ICC sources its woody biomass from two main areas: sawmill residue and forest derived waste. From an economic standpoint, it’s preferred to use forest derived waste, including tops and limbs, when it’s available. The campus is currently exploring other more cost-effective sources of woody biomass. The table below shows how the various feedstocks compare to natural gas. For ICC, the project’s main goals are not solely about saving money. The project serves as a demonstration site for others interested in using woody biomass as a heating fuel. Jones stressed that first and foremost, ICC is an education site, and while heat for the campus remains a top priority, another main goal for the project is to continue providing tours and increasing awareness about the positive impact that using woody biomass as a heating source can provide to the local economy. He indicated that the current forest capacity could support a “10-fold increase in biomass use.” And, with a Biomass Thermal Energy Production Incentive Program offered by the state, what’s there to lose?